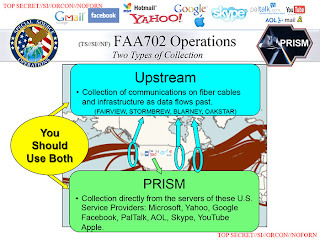 These last weeks, all media have been into PRISM, this espionnage program developed by the NSA, the U.S. National Security Agency for the US government to spy on foreigners via Google, Facebook and other tools such as Skype. But the Washington Post has just unveiled another secret NSA program, which should also be much talked about. The disclosure relates to another espionnage program called Upstream. According to the Washington Post, this program allows the NSA to “collect papers on fiber optic cables and infrastructure as the data travels.” The newspaper also tries to explain a map that shows the NSA submarine Internet cables from the United States to the rest of the world that are essential to the data to properly travel around the world and serves as well the U.S. intelligence: the blue circles suggest places where the NSA collect data, but they are too large for to know exactly where it took place. Code names in brackets in the blue box refer to different operations: “Blarney” handles metadata but the Washington Post does not know what Fairview, stormbrew or oakstar means. This metadata is used by the U.S. government to track terrorists identified or suspected of being, and to link them to the people present in the U.S. who are suspected of helping them. They were also used in the context of criminal investigations taking place abroad and to assist the armed forces stationed outside the United States. However, the laws that define the collection and use of such information is not straightforward. Metadata are not protected by the U.S. Fourth Amendment, while the recovery of the information contained in e-mails and instant as is the case under PRISM messages are allowed by that amendment. Protect your internet connection against espionnage and eye plus ears spying on you, through a VPN service. Your computer is hidden behind the many VPN servers: when you are connected to the VPN, no one can access your computer without passing through Le VPN protected servers. Finally, Le VPN reduces your online movements and protects you against espionnage by replacing your routing information: your IP address will be replaced by an anonymous address. Our secure DNS servers keep secret queries you make, so that no one can take a look at your browsing history. Le VPN also offers mobile solutions for your connections with mobile devices so as to protect your cell phone or tablet.